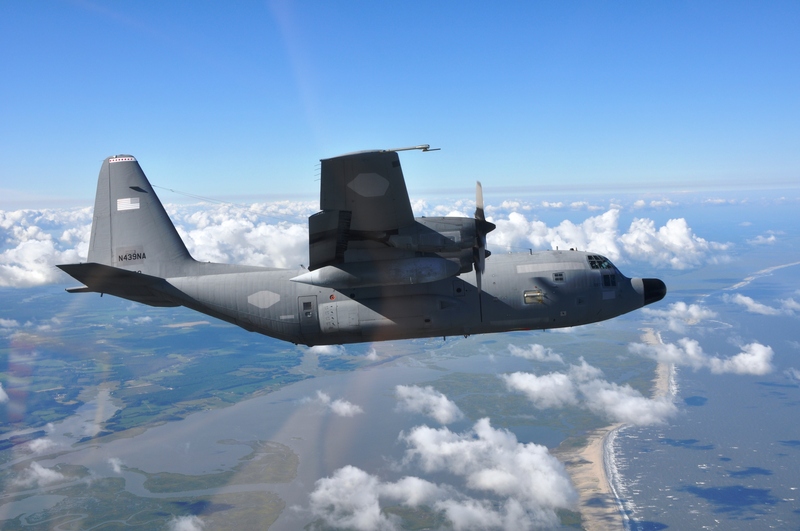 Flying above, below and through clouds in the Arctic gives the ARISE C-130 a different perspective on the world below. Nowhere is this more apparent than through the lenses of ARISE’s digital camera instrument. 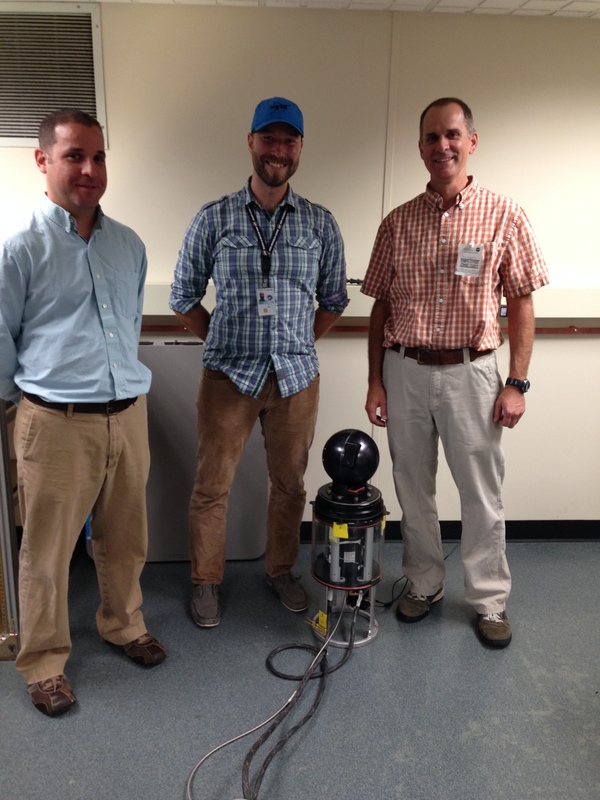 This instrument – one of many ARISE uses – captures views of clouds, ocean and ice that are both scenic and scientifically important. The heart of the digital camera instrument would look familiar to a casual observer. It is made up of two off-the-shelf digital cameras that point down through a clear window in the underside of the aircraft. These cameras are connected to a computer with software that allows the operator to preview images and change camera settings and to a hard drive for storing photographs. An average ARISE flight yields roughly 100 gigabytes of images. Although the cameras are the same make and model, their lenses are different. Group photos and distant landscape shots call for different size lenses, and low-altitude and high-altitude flights do the same. One camera has a 14 millimeter, wide-angle lens to capture views of the surface during low-level flights. The other camera’s lens has a 50 millimeter focal length, making it useful higher up. Similarly, the rate at which the shutters snap ranges between one per second to roughly one every three seconds. From high up the surface seems to pass slower than at low altitude, much like the way telephone poles beside the highway are a blur while far away mountains barely seem to move. Instrument operators can fine-tune this rate to best match the situation and can be managed in flight. While many of the images these cameras capture are breathtaking, they are also useful in several ways. Researchers can use them to measure how much light is reflected from clouds and ice, also known as albedo. 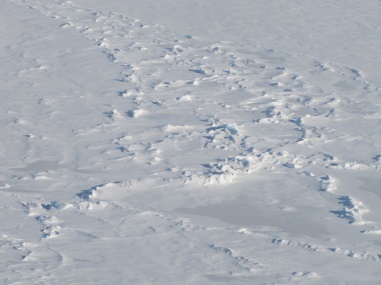 The images also show where there are leads, or openings, in sea ice. ARISE measures ice surface height using the Land, Vegetation and Ice Sensor, which bounces a laser off of the surface and times how long it takes to return to the plane. Locating leads gives scientists a reference for local sea level, helping ensure that measurements are accurate. 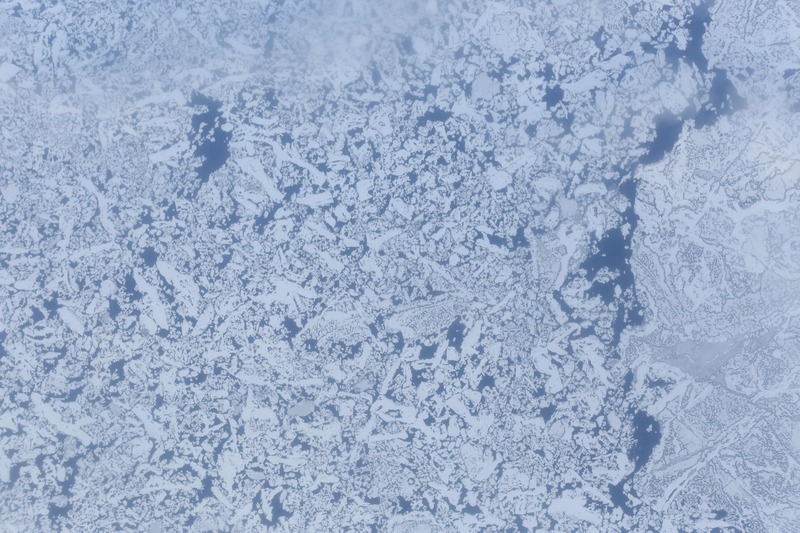 Laser altimeters and other instruments can reveal a great deal about the surface, but through photographs the variety of conditions ranging from open stretches of water to broken bits of floating ice to solid white expanses. 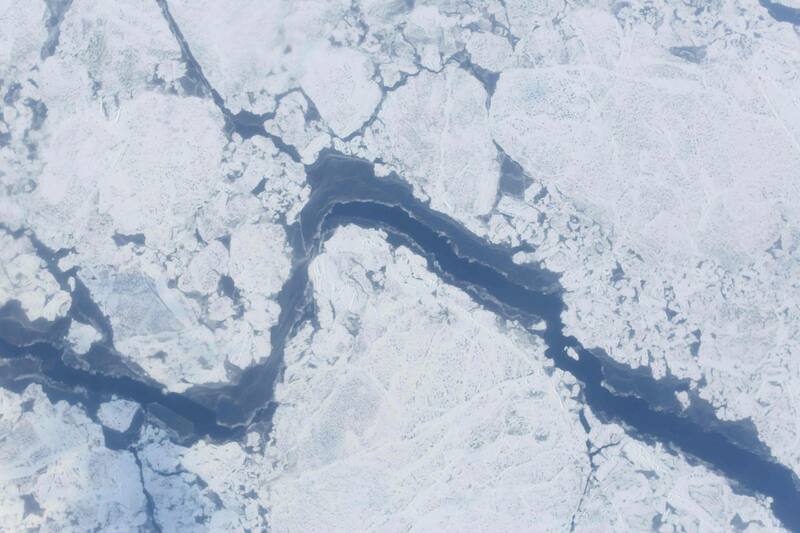 The images captured by these cameras benefit researchers studying sea ice, but the views can also be breathtaking. 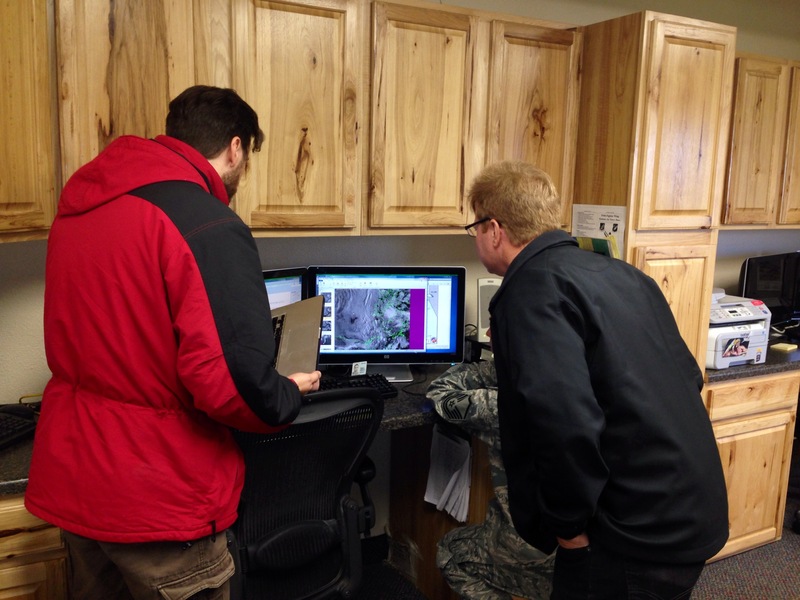 Eielson Air Force Base, Fairbanks, Alaska, day 9 of our deployment: We are currently sitting together in our mission support and flight planning room, next to the Thunderdome Hangar on base. 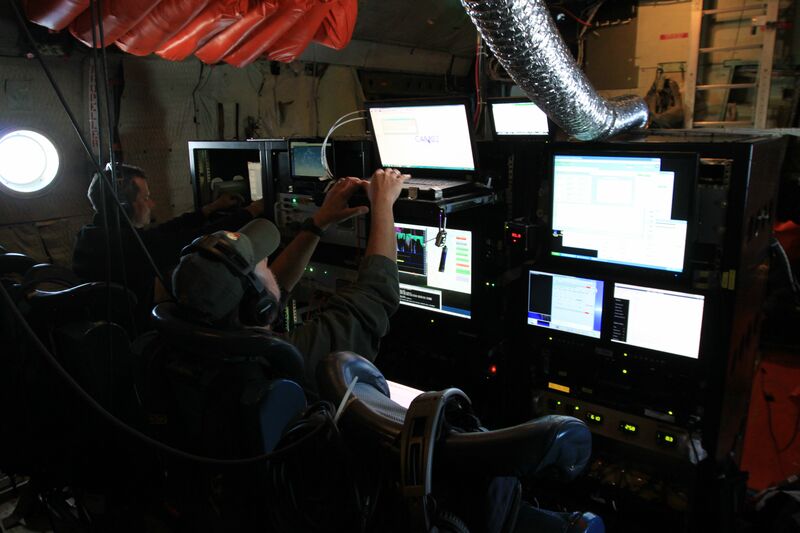 We have appropriately named this room, where we dedicate up to 10 hours each day, our WAR room – where we passionately discuss which ARISE science objectives we’ll fly each day. 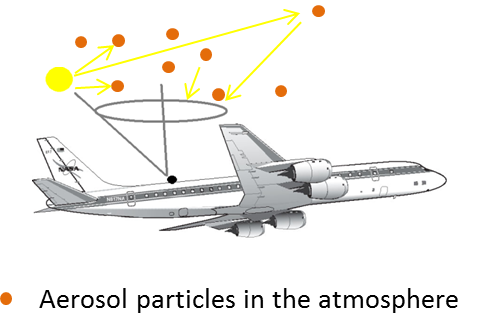 Our broad instrument suite provides us with a great number of options for interesting science flights, yet ironically poses additional challenges, as each instrument requires meteorological conditions that often conflict with one another. 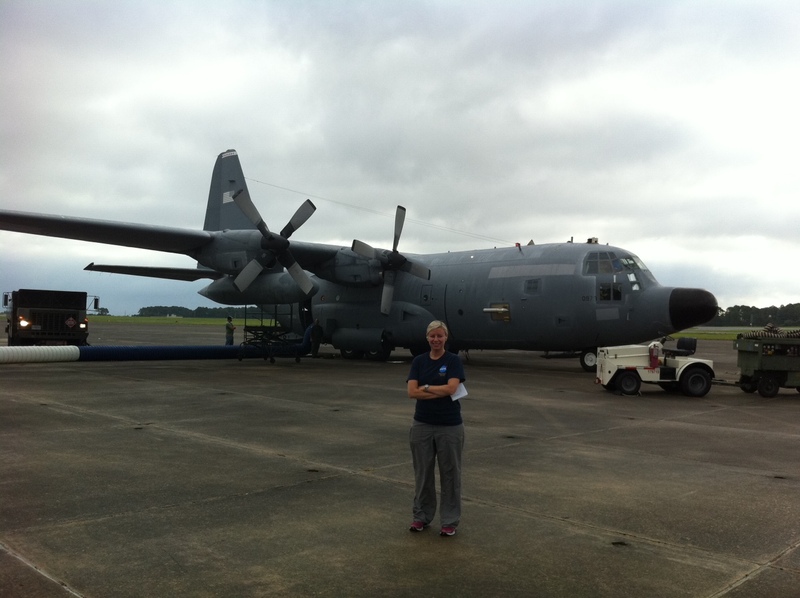 It is here where we follow the C-130 as it flies our science trajectories, a combination of radiation cloud studies and cryospheric sciences. We can communicate with the science team on board via a basic chat system, send them occasional updated satellite imagery, track their flight, and talk on a satellite-based phone system. 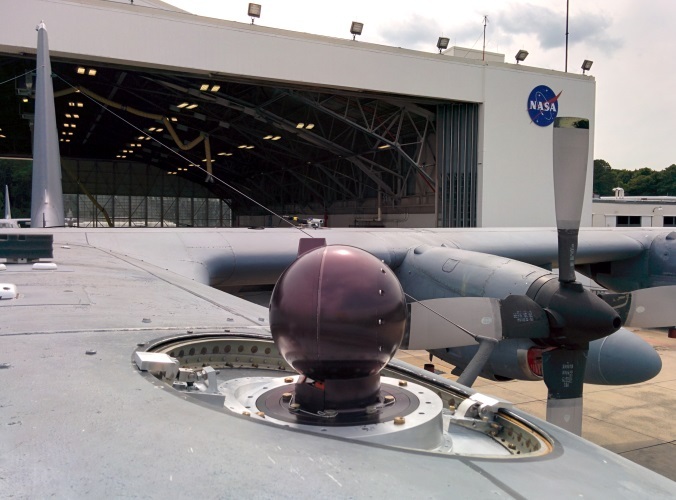 It is the first NASA airborne science mission of its kind, combining a unique instrument suite that would have been unlikely to fly together on the same airborne platform in missions past. And this is what makes ARISE a very exciting mission from a scientific standpoint. New data sets will be combined and studied at the conclusion of this mission. Our general science goal is to develop an understanding of the Arctic regional energy budget. 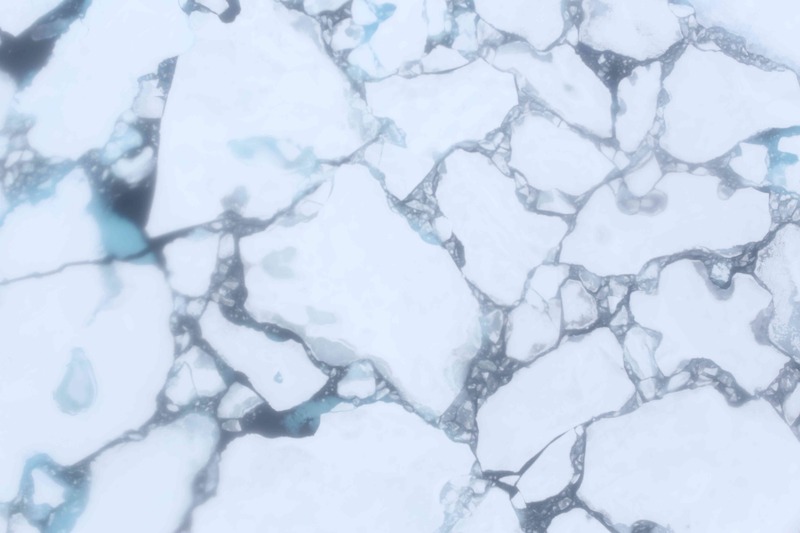 The amount of sea-ice contributes to how much sunlight is reflected back to space, and thus is an important factor in the radiation balance of the Earth. 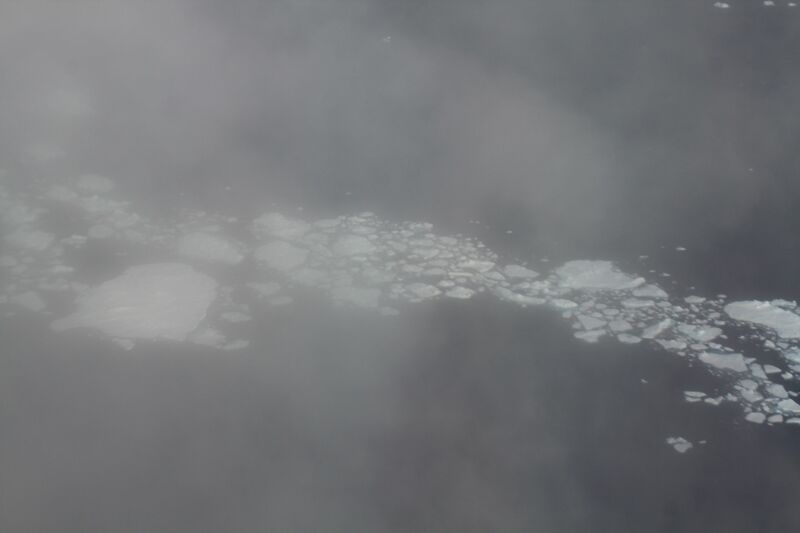 In additional, we are hoping to learn more about how clouds might interact with sea ice to build a more comprehensive understanding of the Arctic energy budget as a whole. Why is this important? Because it will help us better understand our Earth system; changes to atmospheric and ocean circulations, precipitation and temperature patterns, and potential sea level rise. We are surrounded by F-16 and F-18 jets taking off and landing all day, against a radiant and beautiful sky. We see an occasional moose on base and along the interstate during our drives in and out, all the while reminding us we are far away from home. We greet the plane as it lands each day – with a swarm of gnats in our face. As the Project Manager for ARISE, I am reflecting on how far this team has come is such short time. 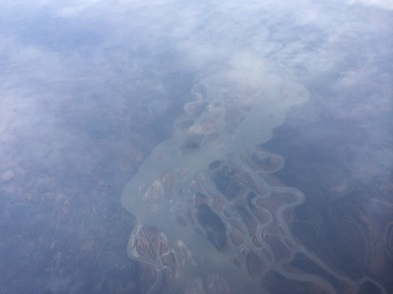 In less than seven months, ARISE has evolved from the initial concept phase, to a fully operational airborne science mission – collecting unique data sets in the Arctic. 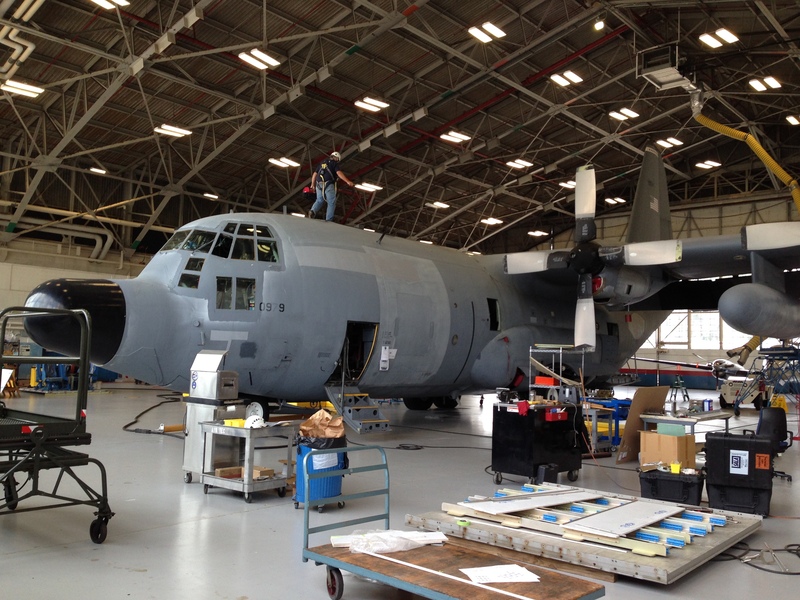 This includes identifying science objectives, identifying team members, identifying instruments to meet the mission goals, defining data products, selecting an aircraft, performing research to establish a base of operations that could meet our C-130 aircraft and science team requirements, obtaining country diplomatic clearances, flight planning, performing C-130 aircraft engineering modifications, completing field logistics, testing and re-testing, and all associated approvals. Bringing a large unique team together, to meet a new set of NASA science goals and requirements, in a challenging environment, within regulations and expected timelines – from start to finish, is what my job is all about. The team of professionals and experts I work with each day, from scientists, to flight crew and aircraft maintainers, to logistics teams, and engineers to managers – have each contributed a unique puzzle piece to the overall mission picture. In just one week, we have completed six new science missions together. And “together” means that greater than 30 people have to work together, on time, in a changing and challenging environment with tight deadlines, every single day. Without all pieces of the puzzle working together well, the mission would not be complete. This first week has proven that we can do it – we have met all initial obstacles and challenges as a team together. We have been moved from our location on base twice, scraped frost from our windows using credit cards, over-heated and froze all in the same day, laughed and politely argued together, heated up ramen noodles and pizza to get us through — all while remembering that we are here together to do GREAT science. My first ARISE day started early in the morning after a late arrival into Fairbanks on the night before. This important mission’s goal is to map the sea ice and understand the relation between the complex cloud scene over the Arctic, the sea ice and Earth’s radiation budget,the balance between incoming and outgoing sunlight and infrared. 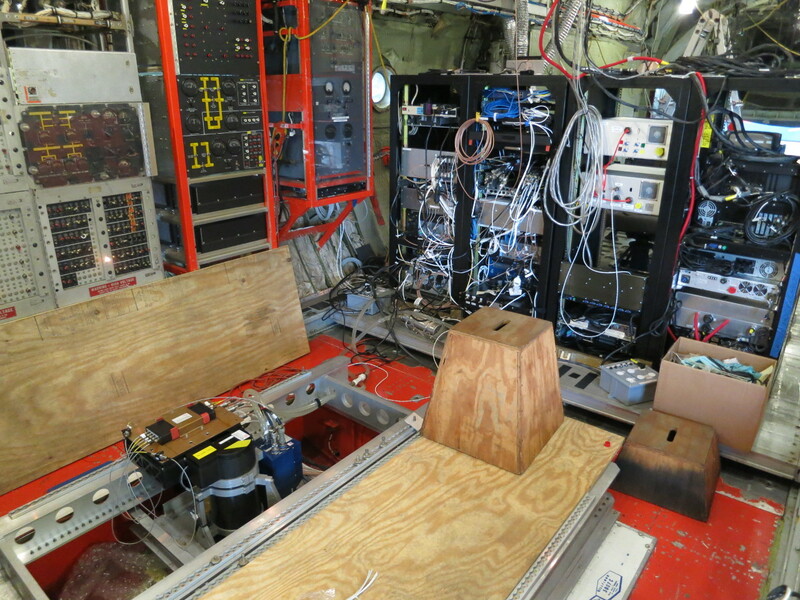 After arriving on base and seeing our instrument (4STAR) on the plane, I am ready to go out there, realizing again that since I am with NASA I get this great opportunity not only to analyze data as many scientists do, but to actually take part in generating this important dataset. After initial preparations like getting used to the noise on the planeand figuring out how to buckle myself in (none of my degrees were proven useful in this case) we took off to the northern parts of our planet. From this big bird’s view, cutting through various cloud deck formations, seeing land cover, ocean and ice I suddenly grasp the immense variability of this region and how we, as a mobile platform, can bridge satellites and ground measurements by going above, in and below clouds. 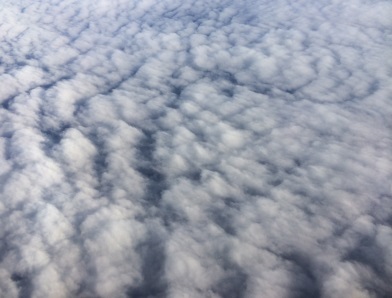 Yes, as is probably obvious from my text and images, I am interested in clouds! 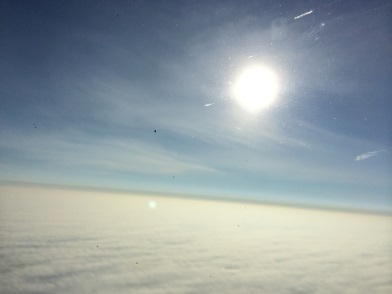 The 4STAR instrument can measure clouds from below, and can also look at the sun and characterize the thin cloud wisps surrounding the sun in this third image. Harmless as they seem, these cirrus (which means a curling lock of hair in Latin) clouds are hard to detect from space and have a large effect on warming/cooling of our planet. After a seven hour flight it is time to land and think about the next flight. My second ARISE flight day started with lots of adrenaline and excitement. We would fly low over the sea-ice sheets! Some regions are broken, with small water lakes in between and some are rock-solid. 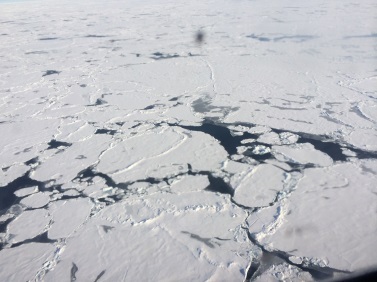 Flying so low over the sea-ice makes me wonder whether I’ll be able to detect a polar bear out there. The views are so awe-inspiring that I am practically out of words or breathe. After eight hours above these amazing surfaces, with some roller-coaster ups and downs, we are back on the ground, and I am with a big smile that will last for many more hours after that.